Last month we had seen the Samsung Ativ S tablet which comes with a keyboard and battery dock. But the major difference between these two devices is what’s under the hood. While the Samsung Ativ S can easily be a laptop or desktop replacement with an Intel Core i5 processor housed within it, the Dell Latitude 10 has taken a different approach in the tablet segment. The Latitude 10 houses an Intel Atom Z2760 which you may have realised from the Atom moniker, is not meant to be a performance powerhouse. With the Latitude, Dell is targetting corporate users who want to experience the best of both worlds - modern UI for media consumption and the Desktop UI for work. But before we see how well it performs and if it fulfils what it set out to do in the first place, let us take a look at the build of this beautiful-looking device. 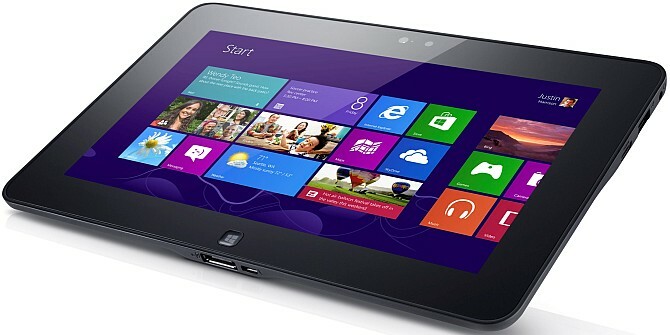 The Latitude 10 comes in an all-black body with a glossy front-finish and a matte-finish on the rear side. A 2.5 cm thick bezel surrounds the actual 10.1-inch display, which may seem like a waste of screen real-estate at first, but makes sense if you take into consideration the gestures on all sides involving you to do a lot of swiping in and out of the screen. There is a single Windows logo button sitting at the bottom-centre of the bezel and a decent 2.0 MP front-facing camera at the top. The Corning glass used for the display is scratch-resistant. The body is made of magnesium alloy thereby adding a bit of sturdiness to the tablet. All the edges on the Latitude 10 have something or the other: the microUSB port and proprietary charging port on the bottom edge; a volume rocker on the top left-hand edge with the facility to add in a Kensington lock below; on the top edge, you have the SD card slot, followed by the power/stand-by button and an auto-rotation lock key and finally coming to the right hand edge, you have a 3.5-mm audio jack, the USB port and a mini HDMI port. When you look at the front face of the tablet, the only non-glossy element is the thin strip of the protruding edge.